With a stay at Al Ahsa InterContinental, you'll be centrally located in Al Ahsa, within a 10-minute drive of Fawars Mall and Luna Park. 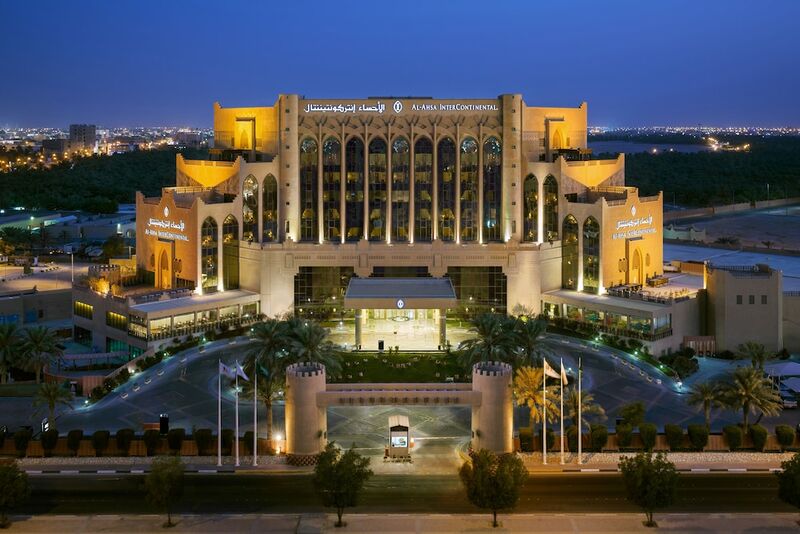 This 5-star hotel is 4.3 mi (6.9 km) from King Faisal University. Make yourself at home in one of the 166 air-conditioned rooms featuring refrigerators and LCD televisions. Your Select Comfort bed comes with down comforters and Frette Italian sheets, and all rooms are furnished with sofa beds. Complimentary wired and wireless Internet access keeps you connected, and satellite programming provides entertainment. Private bathrooms with bathtubs feature complimentary toiletries and bidets. Relax at the full-service spa, where you can enjoy massages, body treatments, and facials. If you're looking for recreational opportunities, you'll find a health club, an indoor pool, and a spa tub. Additional amenities at this Art Deco hotel include complimentary wireless Internet access, concierge services, and gift shops/newsstands. Grab a bite at Al Bustan, one of the hotel's 4 restaurants, or stay in and take advantage of the 24-hour room service. Snacks are also available at the coffee shop/café. Quench your thirst with your favorite drink at the bar/lounge. Buffet breakfasts are available daily from 6:30 AM to 10:30 AM for a fee. Featured amenities include complimentary wired Internet access, a 24-hour business center, and limo/town car service. Planning an event in Al Ahsa? This hotel has facilities measuring 79621 square feet (7397 square meters), including a conference center. A roundtrip airport shuttle is provided for a surcharge (available on request), and free valet parking is available onsite.